It was in early 2012 when sound artist Jon Leidecker first phoned Dieter Moebius and Tim Story to invite the pair to visit him in a studio high in the mountains of Montana, where they would spend a week recording together. This was unusual because by 2012, most collaborations didn’t take place face-to-face, but over the internet. The proposition sounded too good to be true. However, but Jon Leidecker made it clear that there were strings attached. Tim Story knew of Jon Leidecker and had been aware of his work for some time. He knew that Jon Leidecker was a member of the experimental music and art collective Negativland, and produced music as Wobbly and was also a member Sagan and The Freddy McGuire Show. The music Jon Leidecker produced was inventive and innovative, and Tim Story had admired the music from afar. Now he was getting the chance to work with him for a week, in a stunning setting in a studio high in the mountains of Montana. This was a tantalising prospect for Jon Leidecker. The late Dieter Moebius was of the same opinion, and always enjoyed an adventure. He needed very little persuading to make the journey to Montana, and was soon penciling the date into his diary. By then, Jon Leidecker and Dieter Moebius had decided to take their wives with them, and they could spend some time sightseeing while their husbands spent the day in the recording studio. In September 2012, Dieter Moebius and his wife Irene, and Tim and Maggie Story flew out to Whitefish, Montana. The plan was that Irene Moebius and Maggie Story would spend some of the time visiting the nearby Glacier National Park, and then would spend the rest of the time at a motor lodge on the outskirts of the town of Whitefish. As the two couples touched down in Montana, everyone was looking forward to the week ahead. Especially Dieter Moebius and Tim Story, when they arrived at the recording studio high in the mountains of Montana. This was no ordinary studio though. Instead, it was Brett Allen’s state-of-the-art Snowghost recording studio, which was perched chalet-style above Whitefish Lake. This was an ideal location for Dieter Moebius, Tim Story and Jon Leidecker’s to record their first collaboration. 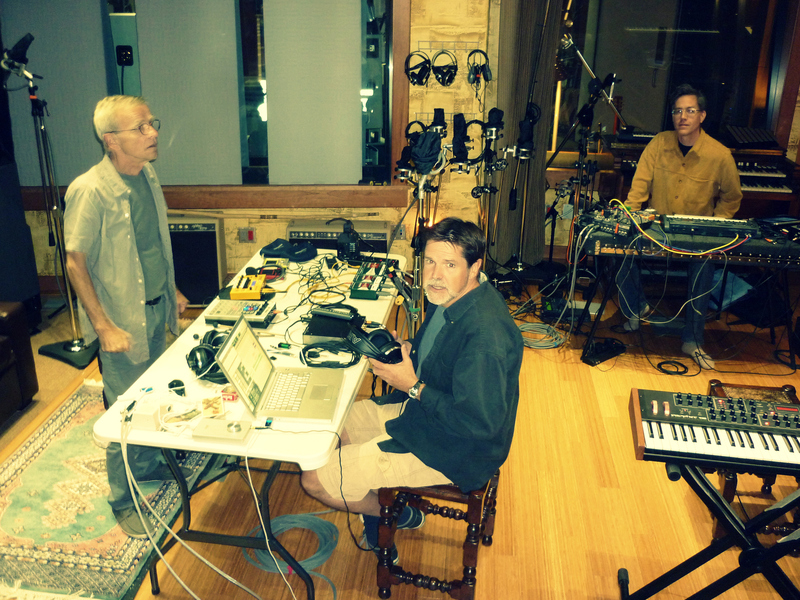 Over the next week, Dieter Moebius, Tim Story and Jon Leidecker worked together in the Snowghost recording studio. The sessions were like how albums used to be recorded, with the three musicians interacting and working late into the night. So much so, that the days became as the collaborated on what they hoped would be their first album together. By the end of a fruitful week, Dieter Moebius and Tim Story flew home with the basis for not one, but two albums stored on a hard drive. When Dieter Moebius and Tim Story arrived home, the next step was post production process. Eventually, Moebius Story Leidecker’s first collaboration together, Snowghost Pieces was released by Bureau B in 2014. Critical acclaim accompanied the release of Snowghost Pieces, which was hailed as one of the finest electronic albums of 2014. However, the success of Snowghost Pieces proved to be a Pyrrhic victory. Tragedy struck when Dieter Moebius had been diagnosed with cancer. Suddenly, music didn’t matter any more, as Dieter Moebius was fighting for his life. Sadly, Dieter Moebius died on the ‘20th’ of July 2015 after what had been a brave and lengthy battle against cancer. He left behind a richest musical legacy. This included some of the music from the Snowghost sessions in September 2012. 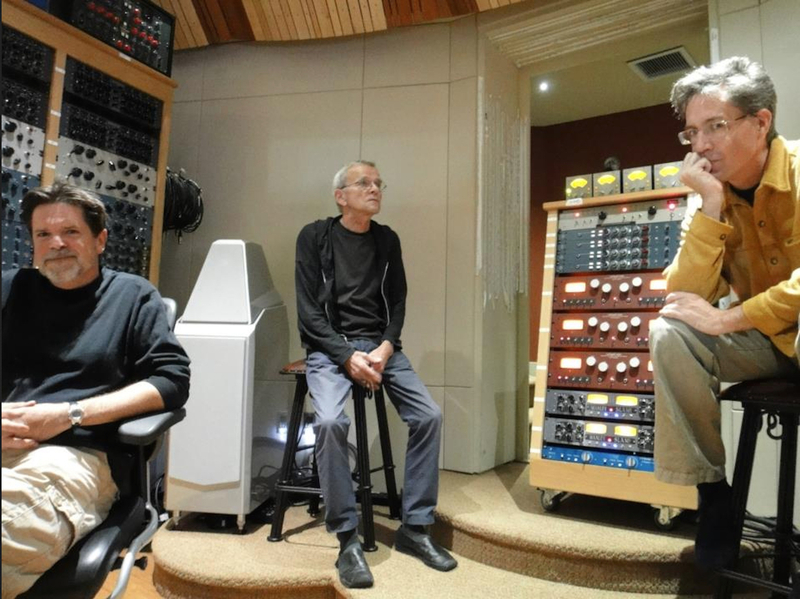 During that week, some of the music that Dieter Moebius, Tim Story and Jon Leidecker made, emerged out of sessions where the three men improvised. Suddenly, music emerged that was variously beautiful, ambitious, abstract and had a restlessness. It included some of the best music that had been recorded during that week during September 2012. Tim Story and Jon Leidecker decided that the time had come to release this music. While Tim Story had taken charge of post production on Snowghost Pieces, it was decided that this time, Jon Leidecker should do so. He began post production, and eventually the second album from Moebius Story Leidecker was complete. It became Familiar, which will be released by Bureau B on the ‘6th’ of October 2017. With Familiar ready for release, all that was needed was an album cover. That was when Tim Story and Jon Leidecker remembered a photo that Dieter Moebius had taken during their adventure in Montana. The pair remembered visiting a particularly beautiful part of the Rockies and stopping to admire the vista. As most of party enjoyed the view, Dieter Moebius noticed a pink plastic construction marker half-buried in the gravel. It was a crass, tasteless and dusty manmade ‘flower’ that sat in the midst of what to many was paradise. However, Dieter Moebius saw something in this piece of alternative art. It was subversive, and totality unexpected and unexplained, but also had a familiarity. Realising this, and that it had the same inquisitive spirit that resulted in Moebius Story Leidecker embarking on musical career, Dieter Moebius took a quick picture not of paradise, but the marker buried in the gravel. That photo became Familiar’s album cover. 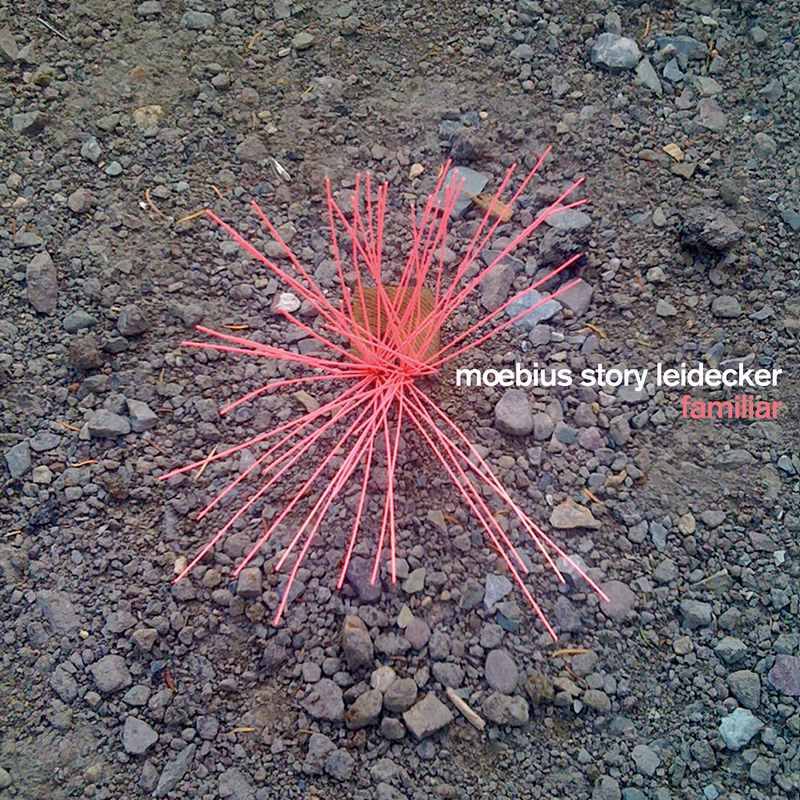 Now Moebius Story Leidecker’s sophomore album Familiar was ready to release by the Hamburg based label Bureau B. It’s eagerly awaited followup to their critically acclaimed debut album Snowghost Pieces. A myriad of disparate, leftfield sounds combine as Wrong unfolds, and opens Familiar. They create a futuristic, but strangely melodic backdrop. It sounds as if it’s part of the lost soundtrack to an Eastern European cartoon from the seventies. By now, there’s a mesmeric and robotic sound as if Kraftwerk’s man machine has come to life. Meanwhile, a variety of squeak, beeps, boings, cheeps and whistle combine with whines, whistles and drums. There’s even bursts of trumpet as the man machine breakdances and during this ambitious, but melodic and genre-melting soundscape. A squelchy Acid House synth beeps and squeaks mesmerically on Zucken. It heads in the direction of the dance-floor as percussion and found sounds join with squawking, squeaking and squelchy synths. They play their part in this hypnotic, dance-floor friendly soundscape. Later, haunting, otherworldly sounds join the drums as synths continue to squawk, squeak and beep as Moebius Story Leidecker create what sounds like the a hypnotic floor filler at an interplanetary disco. Straight away, the shuffling beat in the introduction to Familiar has an early eighties sound. It’s soon joined by handclaps, eerie, futuristic sounds and a booming bass synth that adds an ominous backdrop. Whirring, whirling, fluttering, hovering and ghostly sounds are joined by percussion. Meanwhile, the bass synth create drama and tension as otherworldly, sci-fi sounds assail the listener. Later, when the arrangement is stripped bare, the drama, tension and futuristic sounds join percussion and the broody bass as Moebius Story Leidecker continue to create the soundtrack to a journey into another world. That soundtrack is dramatic, futuristic, melodic and cinematic. It’s also full of imagery and guaranteed to paint pictures in the mind’s eye. A bass synth makes its presence felt on We Need You in Our Soups before a piano plays slowly, thoughtfully and deliberately. They’re joined by a subtle sprinkling of percussive, droning, eerie and metallic sound. Meanwhile, swells of bass synth rise and fall as if replicating a small plane, while keyboards provide a melodic accompaniment. Soon, the bass synth moves to the front buzzing and droning, as the arrangement reverberates. By now there’s a degree of drama, which is omnipresent for the remainder of the soundscape. It finds drums combining with percussive sounds as the bass synth plays a starring role in this carefully crafted and captivating cinematic soundscape. Futuristic and otherworldly describes Block Blow as it reveals its secrets. Beeps, speak, chirps and cheeps accompany a bass synth and briefly, a piano. Soon, sci-fi sounds join glacial and squelchy synths as an array of disparate sounds are added to this mesmeric, genre-melting soundscape. It combines elements of electronica, avant-garde and experimental music. Later sci-fi synths are unleashed as ethereal vocals soar above the choppy, arrangement as bell rings and join drums and urgent piano. At one point, some of the sounds Moebius Story Leidecker unleash sound as if they belong on computer game. By then, choppy an d urgent has become robotic and hypnotic before dissipating, as the three pioneers continue to push musical boundaries in their pursuit of musical excellence. Vexed is a fifteen minute epic and closes Familiar in style. As a piano plays slowly, melodically and ruminatively, drums provide the heartbeat and a myriad of sounds interject. They range from found sounds to ethereal and eerie to futuristic and otherworldly. Sometimes, strings are plucked and join drones, as sounds buzz, beep and crack adding to what’s now an eerie, otherworldly soundscape. Later it becomes dark and ominous as growling, groaning, ghostly and cracking sounds emerge. Soon, this chameleonlike soundscape becomes understated before rebuilding as a piano plays and shows a much more melodic side. Gone is the darkness, although a few futuristic and leftfield sounds interject and join strings as a quite beautiful ethereal soundscape takes shape. It’s very different to the earlier part of the Vexed suite, which shows Moebius Story Leidecker’s versatility and inventiveness. Three years after Moebius Story Leidecker released their debut album Snowghost Pieces, the much-anticipated and eagerly awaited followup Familiar will be released by Bureau B on the ‘6th’ of October 2017. It’s a fitting followup to their critically Snowghost Pieces and finds the three musical pioneers continuing to push musical boundaries to their limits and sometimes, behind on their genre-melting sophomore album Familiar. It finds Moebius Story Leidecker fusing elements of abstract, ambient, avant-garde, Berlin School, electronica and experimental with industrial, Krautrock and Musique concrète. It’s a powerful and potent combination where Moebius Story Leidecker combine traditional instruments with technology, samples and found sounds. The music Moebius Story Leidecker made was then manipulated with an array of effects. This was the musical equivalent of sleight of hand, with nothing as it seems on Familiar which is a multilayered musical tapestry woven by the triumvirate of Moebius Story Leidecker high in the mountains of Montana. Over a week, the trio created two captivating albums of captivating and cinematic soundscapes, Snowghost Pieces and Familiar. It features music that is dark and dramatic, to elegiac and ethereal, to eerie, futuristic, haunting and otherworldly. Other times, the music is atmospheric and evocative, before becoming ruminative and thoughtful. Always the music on Familiar is imaginative, inventive, innovative and cinematic. So much so, it’s as if Moebius Story Leidecker were creating a series of soundtracks to short films that are rich in imagery and sure to paint pictures in the mind’s eye. That was the case with much of the music that one member of the triumvirate created during a long and illustrious carer. That is the late, great Dieter Moebius, who sadly, passed away on the ‘20th’ of July 2015, after what a brave battle against cancer. He left behind a rich musical legacy including his contribution to Moebius Story Leidecker’s eagerly awaited sophomore album Familiar. It was recorded five years ago in September 2012, and will be released just over two years after Dieter Moebius’s untimely death. Familiar is just of one of countless collaborations Dieter Moebius was involved with during his career. Sadly, it was his final collaborations during a career that spanned six decades. Fittingly, Dieter Moebius’ final collaboration Familiar, was a meeting of musical minds, where the talented triumvirate of Moebius Story Leidecker create an ambitious album of atmospheric and evocative cinematic soundscapes.